Large selection of Sterling Silver Curb Link design Bracelets for Men and Women to wear. Excellent wholesale prices on all our Curb design Bracelet and wrist wear, created in Quality Sterling 925 Silver. 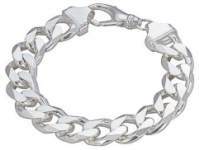 Select from elegant Ladies Curb bracelets, 1oz solid rounded curb chain link, upto Extra Large Gents massive 9 inch solid heavy Curbed Link Bracelets. We stock link styles from Diamond Cut Curb, Flat Open Curbed Link, to Classic Round Curb design Silver Bracelets. Sterling SILVER SOLID HEAVY 9mm WIDE CURB BRACELET. 8inch length 205mm. Excellent Heavy Curb Bracelet. Sterling SOLID 925 SILVER approx. 9mm wide. Sterling Silver fine Curb Bracelet, 2mm gauge 925 Curb Bracelet in 180mm length. Sterling Silver solid Curb Bracelet 4.5mm wide gauge, approx. 215mm (8.5inch) length. Sterling Silver diamond bevel edge cut wide solid 5mm Curb Bracelet 205mm long. Sterling Silver wide solid diamond cut Curb link Bracelet in 8inch (210mm) length, heavy classic Curb Bracelet. Sterling 925 Silver Square diamond cut edge Curb 5mm wide Bracelet 210mm length, polished finish. Heavy solid Square Curb Sterling Silver 925 Bracelet. 210mm (8inch) length and Wide 6.5mm gauge Square design polished finish links. Trigger fastener Clasp fitted. Sterling Silver Rounded Curb link Bracelet with Quality clasp, 190mm length x 4mm wide. Sterling Silver solid Curb Bracelet in 190mm (7.5inch) length. Solid 925 Silver Curb Bracelet with Lobster Claw clasp in 4.5mm gauge width links. Heavy solid Round Curb links Sterling Silver Bracelet. 195mm length with rounded curb 6mm gauge solid links and lobster clasp.